PennsylvAsia: Duolingo launches Korean for English Speakers course today. Duolingo launches Korean for English Speakers course today. 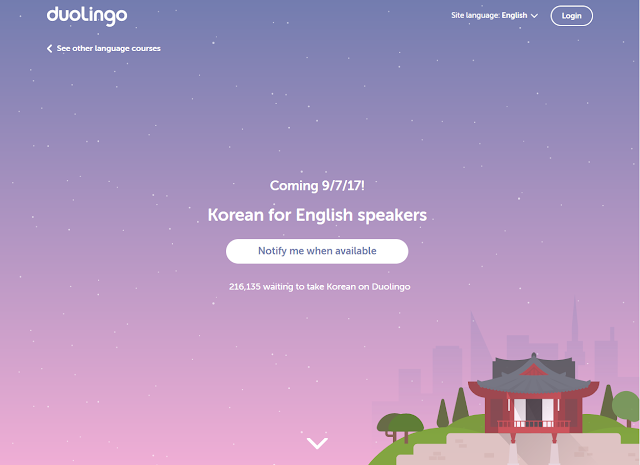 Pittsburgh-based Duolingo has launched a Korean for English Speakers course today, according to its website. The web-based version is not currently available, but is accessible via its mobile app. Initial reviews are poor due to, among other things, its ignorance of formality levels and its translation exercises with no practical meaning. Korean is the fastest-growing language at the university level, according to the Modern Language Association, and enrollment in first-year Korean courses at Pitt has increased nearly three-fold in the last decade.. The immense growth is due in large part to the popularity of Korean music, movies, and TV shows. "There's no doubt that Korean popular culture in film and music has captivated the minds of young people," said Rosemary Feal, executive director of the Modern Language Assn. Duolingo announced the development of a Japanese course in March, and was hiring a Teaching Expert for a future Mandarin course in August.